In the latest attempt to end a 142-year-old dispute over Cauvery waters between Karnataka and Tamil Nadu, the Supreme Court on Friday morning pronounced that Tamil Nadu’s share of Cauvery waters has been reduced by 14.75 TMC which has been allocated instead to Karnataka. The decision, taken by a Bench comprised of Chief Justice Dipak Misra and Justices Amitava Roy and A M Khanwilkar, has come a year after a bitter dispute during 2016 and 2017 when the river had all but dried up. The verdict changes the allocations made in 2007 by the Cauvery Water Dispute Tribunal (CWDT) that had awarded Karnataka 270 TMC, Tamil Nadu 419 TMC (of which 192 TMC was to be released by Karnataka), Kerala 30 TMC and Puducherry 7 TMC. Now the amount of water to be released by Karnataka has been slashed by 14.75 TMC and Tamil Nadu is to receive only 177.25 from its neighbouring state while Karnataka’s share will increase to 284.75 TMC. The amount of water will now be available to meet the drinking needs of Karnataka and its capital Bengaluru which will receive 4 TMC of additional water from Cauvery. The SC declared that the decision was taken considering that the CWDT had failed to take into account groundwater held below the Cauvery basin in Tamil Nadu although the net irrigation area was correctly calculated. To relieve the stress that will undoubtedly be felt in Tamil Nadu from the new verdict, the SC has reportedly also allowed the extraction of up to 10 TMC of a total of 20 TMC of groundwater held under the basin. The final shares of both states now stand at 284.75 TMC for Karnataka and 404.25 TMC for Tamil Nadu of which 177.25 TMC is to be released by Karnataka while Kerala’s and Puducherry’s shares remain unchanged from the CWDT allocations. The verdict has been designed to continue for 15 years before the next review. The Cauvery runs for about 800 km, from the Western Ghats in Karnataka to the Bay of Bengal near Thanjavur, Tamil Nadu. The river irrigates an area of about 81,155 sq km in Karnataka, Kerala, Tamil Nadu and Puducherry. However, the distributaries that fan out of the river and irrigate the fertile delta are non-perennial, and depend on the release of water from Karnataka. This dependency of the Cauvery delta has been one of the major reasons for the dispute boiling over. The river and its tributaries have 86 dams across Karnataka, Tamil Nadu and Kerala, of which 37 were constructed after the 1924 agreement lapsed in 1974. 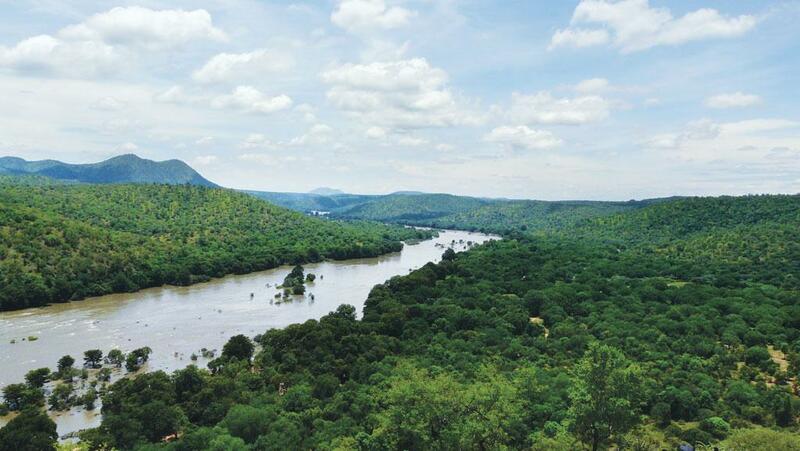 Though both Karnataka and Tamil Nadu have seen heavy damming activity since 1974, construction of dams and reservoirs in Karnataka has altered the balance of the equation, with the upper riparian state’s needs taking precedence. To resolve the mad scramble over river water-sharing, CWDT decided to make allocations to the states concerned whose cumulative demand stood at 1,260 thousand million cubic feet (TMC), while the total utilisable flow of the river, as per the tribunal’s calculations, was only 740 TMC. On the basis of demands, the number of users, the area of the fertile delta and hydrological factors, the tribunal made an annual allocation of 30 TMC to Kerala, 270 TMC to Karnataka, 419 TMC to Tamil Nadu (of which 192 TMC was to be released by Karnataka and 227 TMC was to be generated from Tamil Nadu’s own catchment areas) and 7 TMC to Puducherry. It also calculated that 10 TMC should be allowed for “environmental flows” and around 4 TMC would inevitably flow into the sea. What this distribution means is that virtually every year, the river is 100 per cent utilised. So whenever there is deficit rain, there is a crisis. Although the principles of apportionment stipulate careful consideration of the ecological aspects concerning the river, the allocations have been made primarily on the quantum of use submitted by the states. This is one of the major criticisms the tribunal has faced. The new verdict too, conveniently sidesteps this concern and if anything, it has amplified it by proposing the extraction of groundwater in Tamil Nadu to make up for the shortfall from revised allocations. Early reactions have indicated verdict will unsurprisingly be welcomed in very different ways in both states—while there will be joy in Karnataka, anger and disappointment will most likely be the common reaction in Tamil Nadu. When reading the Judgement on Cauvery water in many news paper, it is given that the learned Judges have considered 10 TMC of Ground water while reducing share of quantum to Tamilnadu. It pained me a lot. Groundwater storage in any medium is dynamic and seasonal. It is a replenishable resorce. We can not fix the quantum in any moment of time. Say if there is no recharge from rain fall or from irrigation due to continueous drought. And If we withdraw 10 TMC from underground of the Delta region, what will happen. Does anyone point this out during the argument. If there is no recharge and if we pump from dead storage, sea water will slowly enter into the underground and it is very very difficult to reproach. The judgment look to me as a cast of natural injustice. Why it can not be reviewed. For Bangalore drinking water need the Delta ground water eco system should not be disturbed and the Delta people should not suffer for Bangalorians water need. Why no environment safe guarding organizations are raising this issue. There is fundamental error in assuming the dynamic resource as a static one and considering the ground water source as fixed quantum. Has any study towards seawater intrusion has been carried out or any groundwater modelling study has been carried out. Without such informative study if 10 TMC of Ground water withdrawal in a season will invite incursion if saline sea water into delta zone if not full at least to few kilometre, as the sediments of delta region is cascaded one and inter connected deposits. We will be mere onlooker and the next generation farmers if delta, I am sure will curse us. What will the do with saline ground water iver the years. Can some one argue with the final authorities. Hope stating the scientific fact and enlightening the reality will not be disobeying court orders.